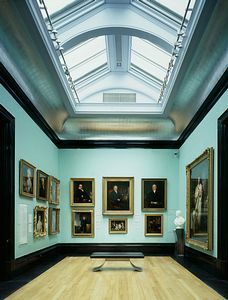 The National Portrait Gallery in London contains over 175,000 portraits of British men and women, of historic importance from the 16th century to the present day. 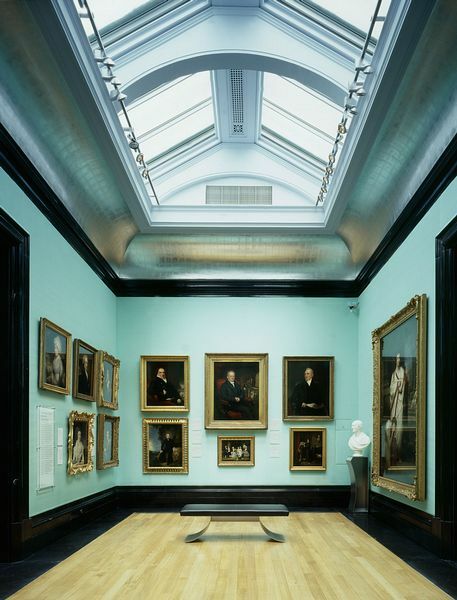 It was the first public portrait gallery in the world. A visit to the National Portrait Gallery today reveals that apart from the impressive collection of portraits spanning the centuries, the gallery also includes sculpture, miniatures, drawings, sketches, photographs, prints and multi-media installations. History lovers may want to make a start in the Permanent Collection section where you can move from one room to the next chronologically. The main stairway reveals a collection effigies of British monarchs, which date to the 13th century. VIII and his wives; also included are Queen Mary Ist, King Edward VI, Sir Thomas Moor, John Donne and the controversial portrait of Shakespeare by Chandos. 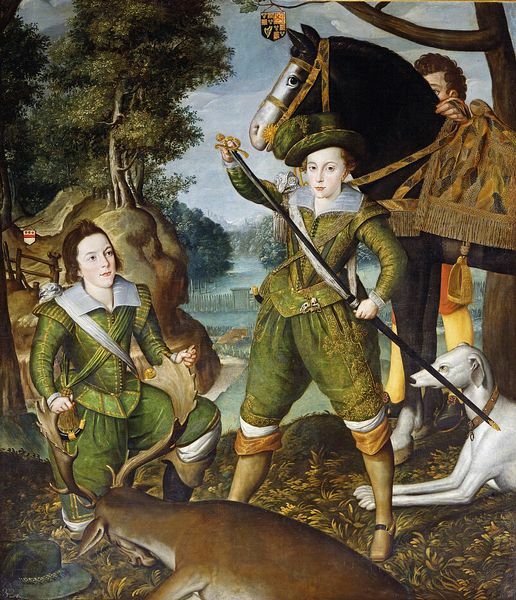 On show in the Stuart Portraits and Civil War collection, you will find King James I of England and VI of Scotland, the Kings Charles I and II, Oliver Cromwell, John Evelyn, Samuel Pepys and a delightful childhood portrait of Prince James Francis Edward Stuart with Princess Louisa Maria Theresa Stuart. 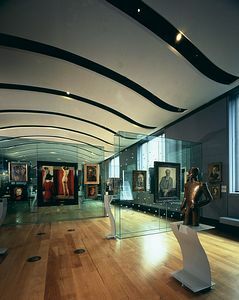 The Georgian and Regency period displays portraits of Queen Anne,Sarah Churchill Duchess of Marlborough and her husband John Churchill 1st Duke of Marlborough, Samuel Johnson, a self portrait of Sir Joshua Reynolds, King George I, James Cook, Emma, Lady Hamilton and Horatio Nelson, to name but a few. 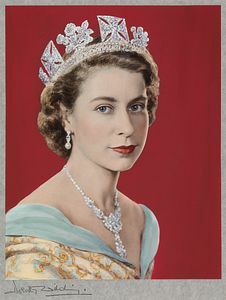 Victorian and Edwardian portraits include Queen Victoria, Prince Albert, The Bronte sisters Anne, Emily and Charlotte by Patrick Branwell Bronte, William Wordsworth, Lewis Carroll, Charles Dickens and Virginia Woolf. in a delightfully nostalgic portrait entitled Conversation piece at the Royal Lodge, Windsor, Rupert Brooke, Lytton Strachey, Wilfred Owen, Vanessa Bell, Gertrude Jekyll, Dame Edith Sitwell, A.A. Milne with the young Christopher Robin Milne, Emmeline Pankhurst, Sir Winston Churchill. There is also a section of contemporary portraits from 1990 to the present day. Included here are Sir Bobby Charlton, Harold Pinter, Alan Rickman, Glenda Jackson, Darcey Bussell, Diana Princess of Wales with her sons, Alan Bennett, P.D. James, fun portraits of Delia Smith and George Melly. 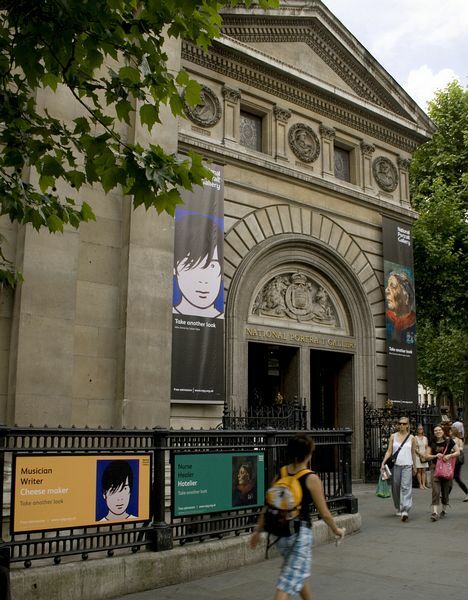 The National Portrait Gallery offer free Gallery sessions, workshops and support digital resources for Primary, Secondary and SEN schools. There are also free weekend and holiday events for children 3 years and over and their families; including family art workshops and storytelling. The young persons programme of sessions, workshops and a youth forum is dedicated to working with 14 - 21 year olds outside of school. Babington Macaulay 1st Baron Macaulay. Trustees included Lord Ellesmere and Disraeli. 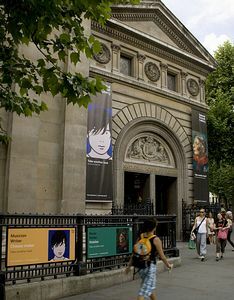 For the first forty years of its existence the Portrait Gallery was housed in a building in Great George Street, moving premises a few times until the government provided a new site in St. Martins Place alongside the National Gallery. With the gift of funding from William Henry Alexander the philanthropist, the architect Ewan Christian was commissioned to design the current building, which was faced in Portland stone, with the busts of the three founders above the entrance. This original building has since been expanded twice. An interesting shop, which stocks a wide range of gifts, books, CDs and DVDs, Jewellery, Greeting Cards, Postcards, Posters and Prints. Fun and interesting items for children are not forgotten. Please note the shop closes promptly as just as the galleries are closed. The Portrait Cafe is a contemporary space, which serves light meals and snacks. The roof-top Portrait Restaurant has one of the best views over London and offers some of the finest British food. Saturday - Wednesday: 10.00am - 6.00pm. Thursday - Friday: 10.00am - 9.00pm. 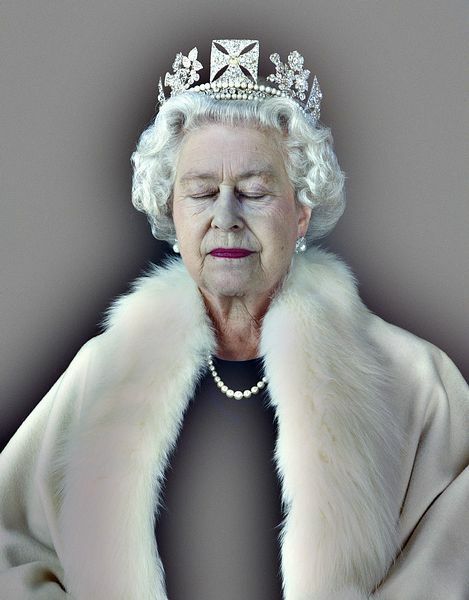 Admission to the National Portrait Gallery is free. Some major exhibitions are ticketed. Is via the Orange Street ramp entrance and the Gift Shop entrance on St Martin's Place. Nearest underground stations are Charing Cross 230 metres. Charing Cross station 320 metres from the St. Martin's Place entrance. Buses 24, 29 and 176 from Trafalgar Square stop C or Charing Cross Road stop K.
The Gallery does not have a car park. There is a public car park approximately 195 metres away from the Orange Street entrance. There are bicycle stands opposite the main Gallery entrance on St Martin's Place, and also behind the National Gallery's Education Centre on Orange Street.